Apathy and laziness turned my plans of absentee gardening into a feral patch of land. Installing hops trellises was the last time the garden received any attention whatsoever. Thankfully the individual who mowed the small barn yard area had the foresight to just steer clear of the garden as he did not know the exact locations of the boundary plants. As a result, the grass in the walkways is knee to waist high. I made quite the mess for myself! I could blame being busy but the undeniable truth is I just did not make the time to get out to the farm. To be fair to myself, I did make it out for the first scheduled maintenance to find my weedwacker unable to remain running. Blisters and a torso that was sore for a week speaks to my frustrations with having to start the machine so often. After taking it to an expert, I learned it was pretty much shot as too much air was mixing in due to non-replaceable parts wearing with over a decade of use. From then on, I just ignored the problem. Rest in Peace friend (despite requiring a constant battle of having to constantly change line only for it to get stop feeding when it melted together only to run out of fuel when everything was finally working properly). Ailanthus. Tree of Heaven’s everywhere. Walnuts. Yes…walnut seedlings in the garden. I love walnuts so I may just try and transplant them, but the production of allelopathic juglone in fruit and veggie gardens is concerning. Asparagus are utterly thriving. However it is now apparent that a few of the plants are female despite the nurseries best effort to provide only males. With 47/50 crown survival rate, I’ll still so satisfied with the plants that I am happy to give a recommendation for Nourse Farms. Cascade hops are thriving, centennial are decent, all other are “meh”. 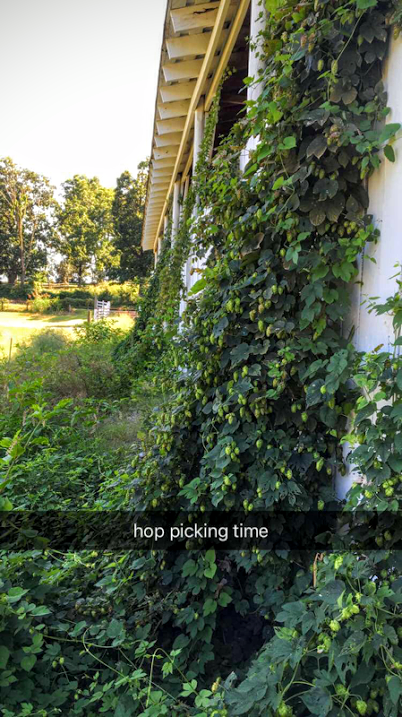 No training was done beyond leaving the hops to find the trellises so there are huge ground level mats of hops vegetation which inefficiently consumed large amounts of nitrogen and nutrients. Next year, ruthless pruning will be done. Where I originally thought invading grasses were knee high in the garden beds, I found most of those were plants from the aisles whose immense weight caused them to lay down over the beds preventing further weed invasions. Similarly, the wild mat of hops growth served the same role. The vast amount of grass clippings created with my borrowed weed wacker gave me plenty of nitrogen and potassium-rich material to pile on the now-unrecognizable boundary bed. The hope here is that the clippings will burn away all the vegetation that has encroached into the mulch. After mowing the aisles I found yet another healthy and happy volunteer pumpkin. I’ve planted exactly zero pumpkins and have had more than 80 successfully grow! I thought a late frost killed my 1 year old mulberry trees, but they rebounded beautifully with nearly full leaf sets. Even the hazelnuts are bouncing back although with much less vigor. Now that hunting season is back, I have more motivation to go to the farm and generate some fresh content. As soon as I can get my thoughts written down and organized into a series of posts, I’ll share a hunting trip that was one of the most amazing experiences of my life so far!